Last year on a trip to California I visited the famed Norton Simon Museum in Pasadena to see a small painting ( 31.7 x 24.1 cm) that the Museum labels, “Head of a Venetian Girl.” The trustees of the Museum still like to attribute the painting to Giorgione even though the label indicates that most scholars today give it to Titian. I revisited the Norton Simon this January to see an exhibition entitled “Lock, Stock, and Barrel: Norton Simon’s Purchase of Duveen Brothers Gallery” only to discover that the young Venetian had become the poster girl for the whole exhibition that began last October and will run until April 27 of this year. In its introduction to the exhibition, the Museum noted that the young girl or ‘courtesan’ played a key role not only in the exhibition but in the Museum’s history. Behind the beguiling Portrait of a Courtesan lies one of the many fascinating tales of Norton Simon’s determination to assemble a remarkable collection of art. The Museum’s excellent website and related video, narrated by curator Carol Togneri, give the full story but here is a brief summary. A few years after the close of the Second World War Norton Simon approached Duveen Brothers Gallery in New York City in an attempt to buy the aforementioned portrait of the young woman. 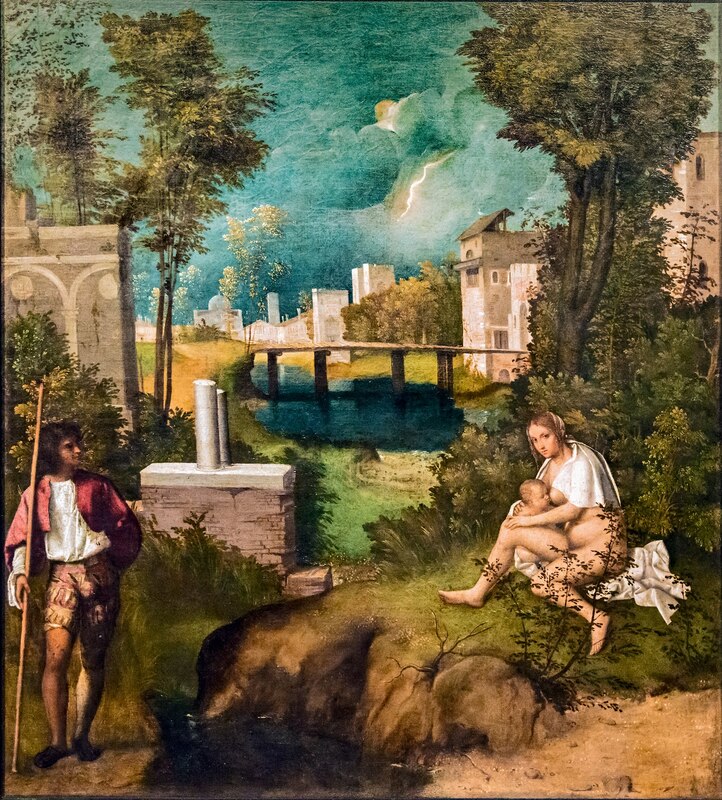 Even back then, a Giorgione acquisition would have added immeasurably to Simon’s collection. The firm of Duveen Brothers had been started by the legendary art dealer Joseph Duveen who died in 1939 after a long career dealing in Old Masters. Although Norton Simon had originally inquired about the painting of the young woman, he eventually offered to buy about a half dozen other Duveen holdings. Finally, as the process of negotiation went on, he offered to buy everything the Duveen Gallery owned including its Park Avenue mansion. The offer was accepted and except the Park Avenue property everything went west to California. Most of the Duveen holdings were put into storage and only a few of the major ones were ever publicly exhibited. The current Duveen exhibition is the Museum’s attempt to exhibit a much larger sample of the entire acquisition. It has been beautifully mounted and displayed. Even the frames are well worth seeing. Still, the small painting of the young woman has been given pride of place. 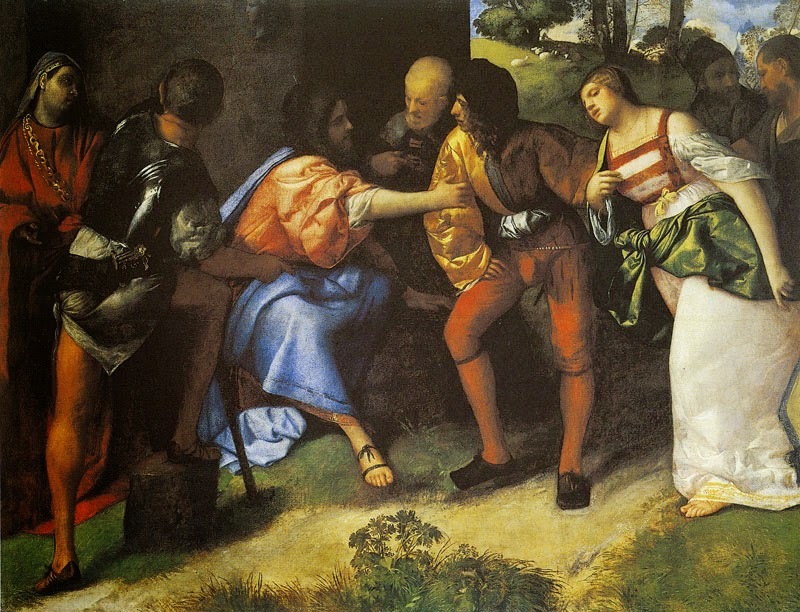 Today even a small Giorgione or Titian is priceless. Earlier at Giorgione et al… I argued that the young girl or courtesan depicted in a partial state of undress was Mary Magdalen, one of the most popular subjects in the art of the Renaissance. I also believe that Giorgione portrayed Mary Magdalen in a similar pose and state of undress in the painting usually labeled “Laura”. However, I would just like to add some words on the subject of the attribution. I agree with those scholars who give the painting to the young Titian who worked with Giorgione on the fresco decoration of the exterior walls of the Fondaco dei Tedeschi. I am not good at stylistic analysis but I would say that the face of the young woman in the Norton Simon painting bears a close resemblance to the face of the adulteress in Titian’s “Christ with the Adulteress”, an early Titian now in the Glasgow Museum. Indeed, contemporary Venetians tended to lump all the sinful women of the gospels into Mary Magdalen. Secondly, the Norton Simon woman wears a multi-colored striped shawl over her shoulder. 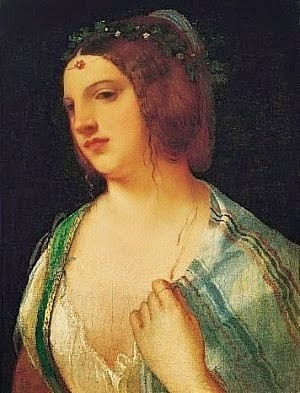 The same shawl can be seen in one of Titian’s much later depictions of Mary Magdalen. Can this be just a coincidence? 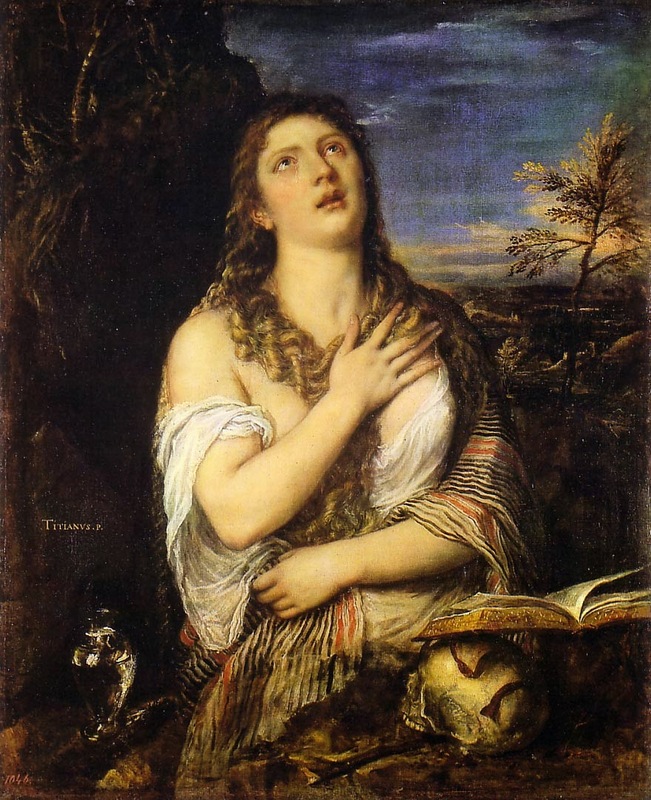 During his long career Titian became the most prolific painter of Mary Magdalen. In my paper on the Sacred and Profane Love I have argued that the two women in that painting now in the Borghese Gallery both represent the Magdalen; one as courtesan and the other as repentant sinner. The Norton Simon "Portrait of a Young Girl" could well be Titian's first attempt while still under the influence of Giorgione. Labels: Mary Magdalen, Norton Simon Museum, Titian, Titian "Courtesan"